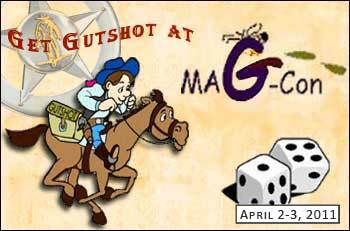 Grab yer six-siders and six-shooters, pardners, it's time to saddle up and head north of Houston for a weekend of gaming for a good cause! Game co-creator, Mike Mitchell, will be on hand to wrangle up some fun and excitement by running the convention-favorite game, "Last Man Standing." "This game is always a hit," Mitchell said, "because the rules are so simple: If it moves, shoot it!" The convention will be at the Annex Building of the New Caney High School, and all proceeds will go to benefit the The Learning Center of New Caney ISD. Admission is $20 for adults at the door, and $10 for children. You may purchase passes online beforehand to save a few bucks. New Caney is about 30 miles NE of downtown Houston on Hwy 59. It's just a few miles north of Humble, Texas. This will be my second appearance at Mag-Con," Mitchell said. "I was very disappointed that I missed it last year, so I'm really looking forward to making it this time. Justo Perez does a great job with these conventions, and we're very glad to offer our support of this worth cause." The convention will run Saturday, April 2 from 9 am to 2 am the following morning. Gaming will resume at 9 am on Sunday, April 3 and run through 6 pm. LAST MAN STANDING -- This here town ain't big enough for all of us... so I'm gonna have to kill yuh. Join us for a convention classic where, if it moves, you shoot it!